Two years ago today, I landed in Qatar. The small details of that night are a blur, but I do remember that my jeans stuck to me from the humidity as I walked down the stairs from the airplane. Then I was driven through the night to the wrong apartment, and it was only realized after most of my very heavy bags had been hauled up the stairs. After I was taken to the grocery store, I was desperate for a shower, and when I got out I couldn’t find my hair dryer in the six suitcases I had brought. The air conditioning was so cold, and I had no idea how to turn it up or off. I put on one of the few winter sweaters I had brought and hoped I wouldn’t get sick. Despite the rough first night, I have made Qatar my home. I have been thinking all week about what I want to say about being here for two years. 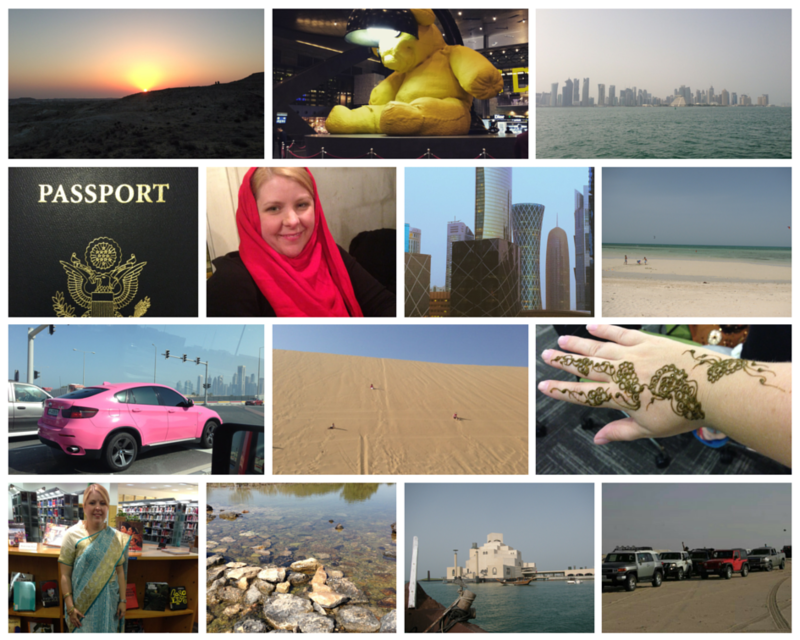 Being in Qatar has taught me so much about the world and its people. I am not sure if I have the right words to describe my experience has been as an expat, but I will do my best to share my thoughts and experiences. Being an expat is to be on constant learning curve and I love that. I can see why many people in some countries go on a gap year. It opens your eyes to so many things to move to another country. I immediately jumped in and started to experience the culture of Qatar. The second weekend I was here, I was at the Inland Sea, which borders Saudi Arabia. Both at work and in social gatherings, I met people from all over the world such as Lebanon, the Philippines, Italy, Austria, Egypt, Ireland and the list goes on. You could travel the world without ever leaving Qatar. Each person is willing to share their story and the story of their country. Everyone is proud of where they are from and I want to know about it. My favorite thing is when I go out to eat with my friends here and I am the only American. The rest of them are from somewhere else. One time this led to a discussion on what kind of road kill is common in their home countries! Being an expat requires you to adapt. Things don’t work the same way that they did in your home country. Buying a car for example, in the U.S. you could walk into the dealership and walk out a few hours later with a car. Here, it took about two weeks. Not a problem and the process was simple, but different. Most things are standardized here so getting car insurance is easy because the price is the same everywhere and I bought this year’s car insurance at the traffic department. However, I was the only western woman in the building and the Qatari women there were working. No one is allowed to pump their own gas here, so you are reliant on someone to fill your gas tank and they also only take cash. Slowly you learn how things work and you adapt and accept. Some expats never adapt or accept and that makes their life hard and they usually don’t stay very long. The serial expat though has become the best adapter and in some ways probably thrives on it. I like change to some degree, so some of this hasn’t been an issue. Although, I still have only gotten a haircut once in Qatar because I have heard horror stories from too many people. Being a single woman expat is a challenge. I would actually say being single expat is harder than being a woman expat. Especially here in Qatar. Qataris and some other nationalities find it hard to fathom that you are here alone. Based upon the looks some have given me when I tell them I am here alone, I think they think my family must not like me or I have done something wrong. It also makes life a bit harder. For example, when your car breaks down and you just leave it because your friends can’t come jump the battery until later. Or when you take a cab to the emergency room because you know everyone is already in bed asleep. Being a woman is another thing entirely. Eventually, you get used to men (and some women) staring at you because in their culture it is normal, and there is no harm in it. As a blond in a city of brunettes, I am the “exotic” one. You learn to stand up for yourself when getting a car repair done or getting the car washed, even more so than in your home country. But you also are relieved to know that if you have a flat tire on the side of the road, several Qatari men (and other nationalities too) will stop to help and you don’t have to worry about being attacked or kidnapped. I know that I can walk through a parking lot at night here, and no one will bother me. After my car battery had died, one of my male Arab friends brought me a portable car battery charger so I wouldn’t be stuck again or dependent on someone to help me. I think he knows me well. What all this has taught me is that I am stronger than I realize and the moment may be hard, but I can handle it. Being an expat has made me want to travel even more. Learning from the other expats about their home countries has led me to add countries on my must see list. I have also had the great experience of visiting a few of these countries with these friends. They fill you with a great appreciation of their country that visiting on your own could never achieve. Being in Qatar has also made me realize that to truly know a place you have to visit for more than a week or a month. Being an expat is the ultimate in slow travel. Too bad I can’t live in every country for two years. Being an expat changes you. When you go home, you realize your life experience is never going to mirror any of your peers’ experiences. Unless you happen to have a ton of expat friends, but even then their experience will be shaped by the country or countries they lived in or where they are from originally. This is not a bad thing, but some people will find it hard to relate to you or they will smother you with questions. Other cultures have now shaped your thoughts and beliefs. It even comes down to simple things like you are always shocked to see people in so little clothes during the summer in other countries because everyone is covered here. You may also be behind on things going on in your home country. For example, I don’t know who all has declared their run for President. I am sure I will pay more attention once we get closer, but until then I will remain blissfully unaware about who is slinging mud at who. Tiffany, this is beautiful!! I can totally relate on everything you’ve written here. An open-mind to accept other’s cultures and beliefs is not about being a good expat or being a good traveler – it’s about being a human being with respect to other people. I am only completing my first year here and although I have lived in Dubai for 7 years, the adjustment I had to do in Doha was still quite a challenge. Thank you so much! I really appreciate it. I agree that it makes you a better human being. Thanks again. On the part about being a single woman living in Qatar, I think that most people there and in the Middle East have the mentality that girls only leave their parents once they get married. They consider girls who live on their own more of a western culture type of thing. Anyways, I think it’s great that you lived there! I have some family out there. Yes this is true of many of the cultures that live here and not just the locals. Where do they live? Thanks for stopping by! What an interesting article, thank you for sharing your story. My husband travels to the Middle East often on business and talks about the many Americans living there. Friends of ours who do live there love it and love the opportunity to meet so many other people and also to travel all over. I’m glad they like it. Thanks for stopping by! Thanks for this window into your world. It certainly has shown me what an inspirational woman you are. Thank you. That is very nice of you to say. Thank you. I try to blend. I have even learned some Arabic but I am never brave enough to try it out with the locals. Congrats on the anniversary and on a very thoughtful, insightful post. You’ve clearly spent a lot of time weighing up the pros and cons of life in Qatar, and drawn some pretty positive conclusions, many of whihc are simialr to the ones we came to, while we were heading for the exit and chewing over what our three years there had taught us. For us, the exposure to different cultures, the extra time it gives you together as a family, the safety of Qatar, the confidence expat life builds in you (not to mention the food!) have all been huge plusses of our decision to move to Doha. Here’s to more adventures and a happy third year to come! Thanks! Deciding to leave is equally difficult I am sure. However, you have to try it. I am sure you will love your next adventure. And I agree about the food!